Some people are naturally ambitious and decisive, figuring out what they want to do with their lives at a very early age. Harry Scheid, the President & CEO of Horst Construction and Horst Excavating, is one of those people. He may have had the ambition and desire to work in construction, but initially, he had to work against the wishes of his teachers and school counselor to get that chance. In his freshman year of high school, he applied to Vo-Tech, but was denied because he was a good student. Entering his sophomore year, he made the same request and a counselor turned him down once again, stating that his grades were too good, and it would be a waste of potential. Undeterred and not one to let someone else direct his future, Harry was able to creatively frame his argument in a way that finally convinced the powers that be that the Vo-Tech program was a good fit for him. The bold move worked, and by the beginning of the second marking period he was admitted into the Brownstown Vo-Tech program for the building trades. His drive and industriousness facilitated his successful completion of the program, and he thereafter entered the construction industry working as a carpenter for a residential home builder. As fate would have it, the timing was not optimal, as interest rates in the early 1980s climbed to 18% and brought the housing market to a standstill. Harry turned to commercial construction instead, working for a local company as a field superintendent for a few years before deciding to partner with a friend to establish his own construction company. “Being the owner gave me a good understanding of how to manage a business. My family and livelihood depended on the business decisions I would make,” he says of the lessons learned during that chapter of his career. After some time, the partnership deteriorated and was ultimately dissolved. In his quest for a career move that would provide stability for himself and his family, Harry was soon offered a position with Horst Construction. Knowing that the company had a stellar reputation and deep-seeded history in commercial construction dating back to the late 1800s, he accepted; and the rest, as they say, is history. Harry’s work ethic, knowledge base, and diligence earned him a series of promotions over the next 30+ years. Originally hired as a field superintendent, Harry moved into the general superintendent position a few years later, followed by a promotion to field operations manager. In 2004, Harry got his first taste of working with the Excavation side of Horst as the Vice President of Horst Excavating. By 2008, his leadership capabilities, business sense, and drive made him the right choice as President and CEO of both the Horst Construction and Horst Excavating companies. While the two companies are considered ‘sister’ organizations, they are two very separate businesses that require individualized attention and strategic analysis. His experience, dedication, and understanding of the industry have clearly informed his well-rounded approach to leadership and have helped to cement the reputations of the businesses he manages. employees and tell stories. He genuinely cares for his team and goes out of his way to show it. One way he does this is by treating every employee to a one-on-one lunch to celebrate their work anniversary on each 5-year mark. It is an opportunity to re-connect with the people he leads, regardless of their position within the company, and helps him get to know his employees on a personal level. Another intentional step to demonstrate his recognition of employees is through Horst Grill Days. 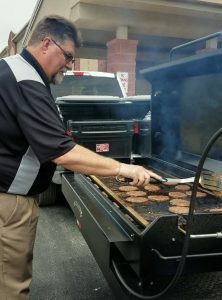 These pop-up events are held at various job sites throughout the warmer months, and Harry – with the help of other executive team members – acts as grill master, cooking up lunch for as many as 100 people at a time. Harry’s journey is, in many ways, the illustration of the American Dream. Through determination, hard work, and the relentless pursuit of his goals, Harry Scheid has cemented his place as a leader in the construction industry.